By Keith Cowing on March 28, 2019 10:08 AM. 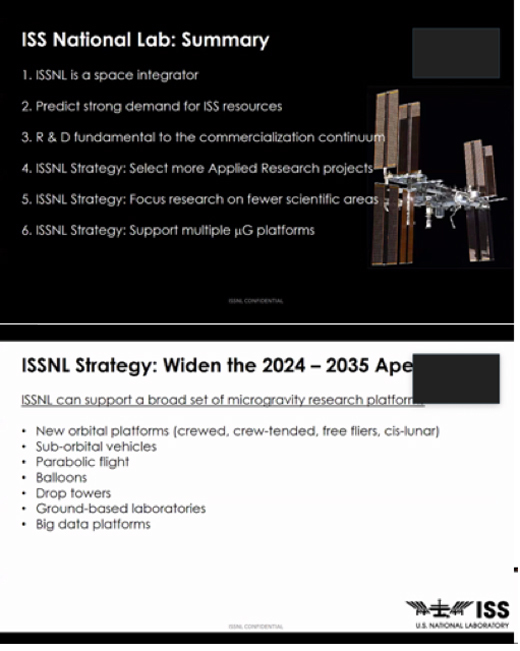 Keith's note: CASIS Chief Strategy Officer Richard Leach made a presentation "Forecasting the 2024-2035 Space Based National Laboratory for Life and Physical Sciences Space Research" at the National Academies of Science Committee on Biological and Physical Sciences in Space meeting yesterday. During that presentation he announced that CASIS aka The ISS National Laboratory has expanded their scope of operations. They are now going to expand well beyond the ISS even though their cooperative agreement with NASA prohibits such an expansion. This Cooperative Agreement is awarded pursuant to Section 504 of the NASA Authorization Act of 2010 (P.L. 111-257, found at USC 8354) by NASA to the Center for the Advancement of Science in space ("CASIS"). The parties agree that the principal purpose of this Agreement is to authorize CASIS to serve as the not-for-profit entity for management of the International Space Station ("ISS") National Laboratory ("NL"), per section 504 of the NASA Authorization Act of 2010, to maximize the value of the investment the U.S. government has made int the ISS and demonstrates the scientific and technological productivity of the ISS over the next decade. CASIS will be responsible for maximizing the value of the ISS to the nation by developing and managing a diversified R&D portfolio based on U.S. national needs for basic and applied research and by using the ISS as a venue for Science, Technology, Engineering and Mathematics (STEM) educational activities. - stimulate, develop and manage the U.S. national uses of the ISS by other government agencies, academic institutions and private firms. 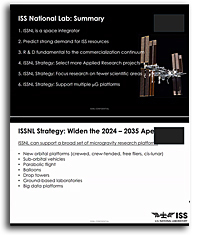 - Develop tools and techniques to communicate the value of uses of the ISS National Laboratory (IS NL) and increase the retuen on the U.S. investment in the ISS. CASIS shall engage exclusively in activities relating to the management of the ISS NL and activities that promote its long term research and development mission as required by Section 504 of the NASA Authorization Act of 2010, without any other organizational objectives or responsibilities on behalf of CASIS or any parent organization or other entity." Note that according to section 1.2.4. CASIS is specifically prohibited from doing anything other than its stated tasks. These new business activities on non-ISS platforms would seem to be a direct violation of section 1.2.4. Moreover, since NASA pays 99.9% of the annual operating expenses of CASIS, the creation and operation of this new business entity (not a trivial endeavor) is most certainly being organized and operated with the use of personnel paid for with NASA funds - unless CASIS is now truly a business venture and is being paid to do these things on a commercial basis. The IRS should find that to be of interest. Either way, in so doing, CASIS is openly seeking to compete in the private sector with companies that it is also supposed to be offering ISS National Laboratory access to - and they do so by confusingly calling themselves "ISS National Laboratory". Just a quick guess would suggest that CASIS is now going to enter markets where companies such as Nanoracks, Virgin Orbit, Virgin Galactic, Blue Origin, ZeroG and many others already provide commercial services. Oh yes, one more thing when it comes to ISS National Laboratory branding: NASA's Director for the International Space Station Sam Scimemi, expressed concern about this in a 31 March 2016 letter to CASIS: "We would advice caution in the lending of the ISS National Lab brand (via your "Space is in it" certification) too freely; care must be taken to ensure that research performed on the ISS has actually influenced product development in advance of awarding the certification. Failure to do so weakens the brand and may lend an air of being nonserious in our mutual quest to fully utilize the ISS as a national lab." I wonder what NASA thinks about all of this. CASIS clearly steps over the line when it comes to what it is they are supposed to be doing - and not doing - and now they do it by claiming to actually BE the ISS National Laboratory in both name and function. Of course, this time, CASIS has kept NASA completely in the loop on these commercial plans and gave NASA a heads up on their upcoming NAS presentation, right? I don't think so. This page contains a single entry by Keith Cowing published on March 28, 2019 10:08 AM. Joe Cuzzupoli was the previous entry in this blog. This Sort Of Behavior Needs To Stop. Now. is the next entry in this blog.